You are here: Home / Watch Buyer / Luxury Watches / Why Has Rolex Been Scrambling? Why Has Rolex Been Scrambling? For those of us who are watch experts, we scoff, and say, “How could you NOT know that it is real or fake, it’s obvious!” But when I was speaking to our new Diamond Gal, she got me to thinking that maybe it isn’t that obvious to the average lay person who might not have done their homework or know all about watches and I thought perhaps I should explain. Serial or Scrambled for Breakfast? 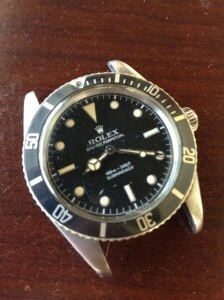 Rolex has always made it easy for the consumer to tell the year and authenticity of their watch by the serial number, which in the older models is etched along the side of case below the six marker. It can be found if you remove the band. The old models all start with a letter and each letter stands for a year. There was never a year that began with X. Since 2010 Rolex started serving up the serial numbers scrambled for breakfast. They are no longer making it easy for the consumer to see what year their coveted Submariner was manufactured, and the burning question would be, how do we find out! Well, you don’t, and Rolex doesn’t care if you know. They like the fact that the retailer can now dupe you into not knowing if the watch you purchase is two years old or 10 years old, after all, they rarely change the models. Does it matter if you have breakfast for dinner? Does it matter if your watch has been sitting on a shelf as long as it has the Rolex name with the sparkly crown perched on top? Let me put it this way. I love pancakes and eggs. I like to have them for dinner. I prefer to eat them for dinner over having them any other time of the day. In fact, nothing makes me happier…other than my Rolex GMT Master II…and who cares when I eat breakfast, no one, not even me. The same goes for the year your Rolex was made. It shouldn’t matter that year it was made. Okay, it might matter if it is a limited edition. It will definitely matter if it is a special anniversary edition. It matters if it is a year that significant changes came out for a particular model, or it could be the first or last year that a particular model number or style was being made. So, in some instances, it makes sense that it might matter the year your Rolex was made, but overall, it doesn’t. You are purchasing a watch that is guaranteed to run for 100 years and even if you do have an issue with it, the service is impeccable. You see, you aren’t just buying a watch when you are buying a Rolex; you are buying an institution and a dream. Rolex, go ahead and serve my watches up scrambled, I’m still buying them because they retain their value and most definitely are worth every penny.